Make your office your own by showing off your books, awards, or accessories with this traditional style bookcase. A pair of sliding doors keep dust off of your valuable items while six adjustable or removable shelves give you valuable flexibility in how you showcase your items. An enclosed drawer adds concealed storage to the sliding door bookcase allowing you to stay organized and keep important documents out of eyesight. The Woodlands Traditional Sliding Door Bookcase with Adjustable Shelves by Flexsteel Wynwood Collection at Olinde's Furniture in the Baton Rouge and Lafayette, Louisiana area. Product availability may vary. Contact us for the most current availability on this product. Handles & Hardware Classic style knobs and bail hardware on drawers and cabinets. 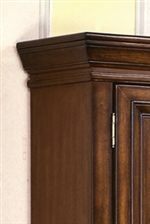 Case Detail Bracket legs, recessed panel sides, capital cornice edges. Storage Six adjustable or removable shelves as well as a drawer. Construction: Case Hardwood solids with rich high quality veneers. Description: Top Finished tops on all case pieces. The Woodland collection offers a timeless solution with office furnishings for your home. Consisting of desks, returns, credenzas, bookcases and hutches, you'll have all the pieces you need to adorn your home office to the height of its potential. 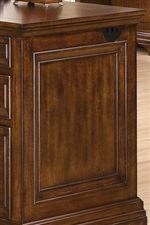 With all items finished in a warm Heritage Cherry and traditional elements of hardware, bracket feet, cornice edges and recessed paneling, your office will be sure to exude classic sophistication. 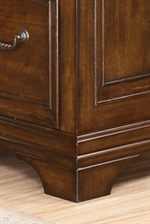 The Woodlands collection is a great option if you are looking for Traditional furniture in the Baton Rouge and Lafayette, Louisiana area. Browse other items in the Woodlands collection from Olinde's Furniture in the Baton Rouge and Lafayette, Louisiana area.